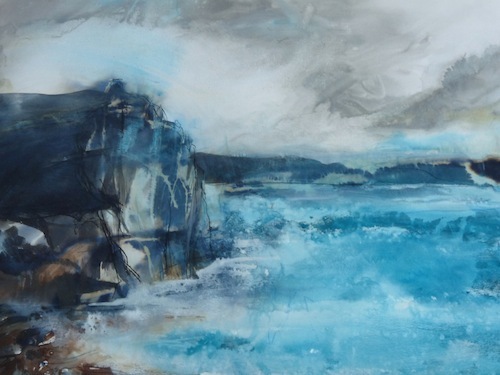 I knew the area quite well and enjoy making work based on the sea and rocks. The location of BV at that time of year was an enormous influence on my work. A little cold and windy for my planned sessions of completing as much of a work as possible outdoors, meant that I used the studio space very much. I was brought up on the Isle of Arran, and this was the first time that I felt such a strong connection to the sea in my adulthood (40 years!). This in turn inspired my work and using simple sketches and colour notes, I was very productive, finishing about 5 largish works at the cottage and taking home 6 started. 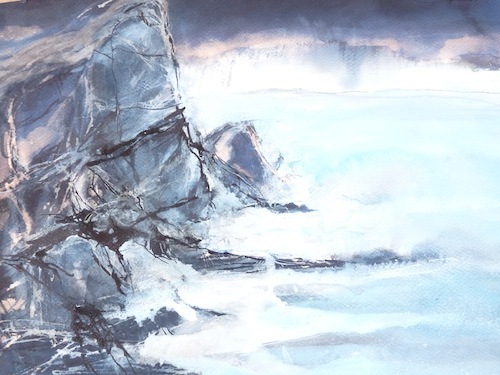 I brought my oil paints with me but quickly preferred the immediacy of acrylic inks on a wet page or canvas, using reed pens and fineliner brushes to explore detail and pick up on the rhythm of rock patterns. I feel that my work has been kick-started again by the stay at BV, pushing me to go into a deeper exploration of colour and reflecting the feelings of being outdoors, rather than being representational. The views from BV meant that I could have stayed put and still benefited from what I needed to produce work. 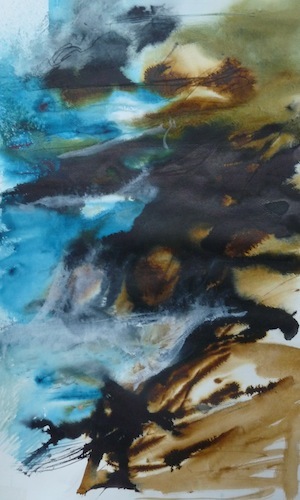 The ever changing mood of sea and sky will stay with me for a very long time as an inspiration for my work. The whole stay was fantastic, the facilities at BV were perfect for an artist. My only regret was not being able to paint on a larger scale! Much if not all of the sketches will be worked up into finished paintings in acrylic ink and Parker Ink. I have 2 exhibitions coming up and these and future works inspired by my stay will form part of this. 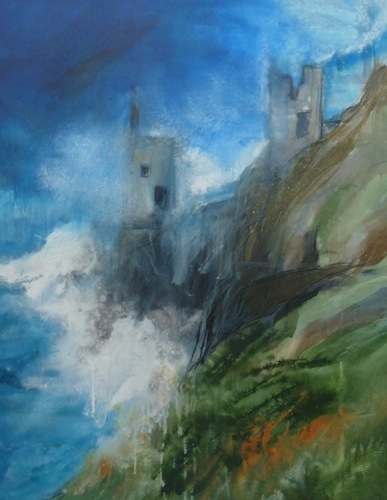 The first is North Somerset Art Week in May, followed by Somerset Art Weeks in October.